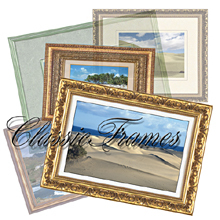 ClassicFrames is the ideal tool to give the final classy touch to your images.The frames provided are exactly the one you would use to hang up expensive paintings or all kind of photos in your living-room. - 60 beautiful traditional picture frames per volume to be used inside Photoshop, PhotoPAINT, Paintshop Pro, Pagemaker, Illustrator, Freehand, and other programs which accept Photoshop compatible plug-ins. - Create or combine existing frames for infinite variations ! - Multiple layers of edges or frames. - Unilimited Layers of Frame! - No Action needed! It is a plug-in!